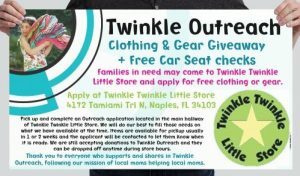 If you are a family in need, we have a Twinkle Outreach Giving Program. We are able to redistribute children’s clothing and baby gear to those in need thanks to the generous donations of our customers. 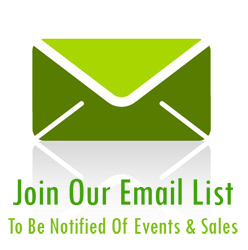 Twinkle Outreach will no longer be doing the monthly on site giveaways. In an effort to provide more help to families, we have changed over to an easier way to get help that will be more convenient to your schedules. You can now come in to Twinkle Twinkle Little Store and pick up an Outreach application located in the main hallway. Fill out the application with as much info as possible on your needs and give it to a Twinkle employee. We will do our best to fill those needs on what we have available at the time. A box is created and available for pickup usually within 1 or 2 weeks and the applicant will be contacted to let them know that the box is ready. We hope this method will enable us to help more people with there current needs. 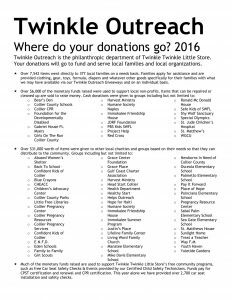 We are still accepting donations to Twinkle Outreach and they can be dropped off anytime during store hours. Thank you to everyone who supports and shares in Twinkle Outreach, following our mission of local moms helping local moms.